With all the brides walking up the aisles this month, it is only natural for the rest of us, the ones still trying to catch that bouquet, to fantasize about that special day. Usually the journey starts with the famous engagement ring. No other ring has been given more value, nor caused more joy. No other symbol has been more desired (by the girls) and more dreaded (by the guys, on occasion) at the same time. So it does not come as a surprise that I’ve fantasized about owning one, too. The most important part of the project is, of course, picking the right diamond, and there are many different diamonds to pick from. And when you are about to spend 2, 5, 10, 20, 50 thousand dollars on a diamond, you want to make sure you know what is the best diamond your money can buy (I’m talking to the guys now). Clarity, Color, Cut and Carat. Cut and Carat are easy to understand. 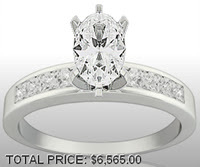 The Cut is the shape of the diamond, round, oval, heart shaped, etc., and it’s more of a personal taste matter. But it is also important in determining the sparkle of the diamond. The Carat is the size of the diamond. 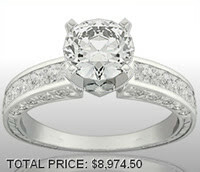 The bigger the size, the more expensive the ring. 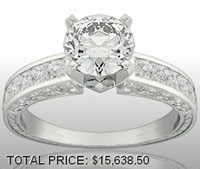 When price is an issue, go for a smaller and better quality diamond, unless size is important. Clarity classifies the purity of the diamond, and the eventual presence of any flaws and/or imperfections. A diamond with fewer imperfections sparkles more. A diamond with no flaws is called “flawless” and it’s the highest grade of clarity, followed by “internally flawless”, VVS1, VVS2, VS1, VS2, SI1, SI2, I1, I2, I3. The Color of a diamond ranges from colorless to slightly yellow. The absence of color enhances the sparkling, so once again here is a scale, to guide us in picking the closest diamond to colorless our budget allows us: D, E, F (colorless), G, H, I, J (almost colorless), K, L, M (faint yellow), N, O, P, Q, R (very light yellow), S, T, U, V, W, X, Y, Z (light yellow). A classic with a twist: a sparkling band, with an oval diamond. 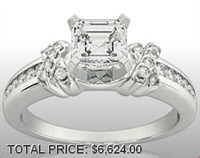 It’s perfect for a young couple, as it is affordable and simple, yet beautiful at the same time. For the same price, I was able to create a more “mature” style, with an “asscher” cut diamond, and a more elaborate design on the band. 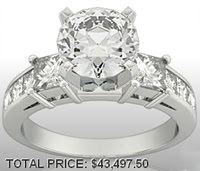 An astonishingly beautiful yet amazingly expensive engagement ring! Go ahead, have fun exploring all the different combinations, and don't forget to bookmark that page! Women and men need to be aware that most of the diamonds in the US come from the horrific diamond business around the world (especially Africa) where many are enslaved or killed for the precious stones. Please watch the movie, BLOOD DIAMOND. These days - not every engagement ring needs to be a diamond. There are many other creative, less expensive, less devastating ways to express love to your partner. I think we need to focus more on the love and quality of the relationship than the size of the diamond ring and how much we spend on the wedding. sita is just a dumbass. "Most" of the diamonds in the US come from reputable sources. Know your jeweler and if you do not have a jeweler, get to know one! It is illegal to do business with the "Blood Diamond" people here in the US. Many diamonds are coming from Russia, although not many really big ones. And, now there is that whole new process of "cultivating" real diamonds...the company is in Florida. Yes, man-made real diamonds, near perfect and in colors for much less cost. And who ever heard of not giving a diamond engagement ring? What loser are you dating? Nice display of aggression there Anonymous. I wonder if you are even in a relationship. How would anyone really know where "Most" of the diamonds come from? And so what if America has some small rules around it - what about the rest of the planet? It is the mind set of competition and comparison that is the real problem. Also, I know first hand (from a friend that comes from South Africa in particular) that DeBeers is one of the worst infiltrators. Hmmm, I see their ads all over American magazines. I appreciate the info about man-made diamonds - yet it is one thing to post an opinion it is another to insult and judge people. Good luck to you and your nasty, negative projections.